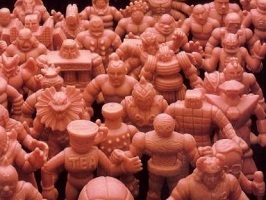 How Much Are M.U.S.C.L.E.’s Worth? The value of M.U.S.C.L.E. figures and toys is often hotly debated between a small number of collectors. Such a small sample of thoughts can often lead to groupthink and a lack of discussion. One way to avoid this bottleneck is to look to others for fresh perspectives, even other hobbies. The blog, Bookride.com, has a simple and rationale explanation for assessing the value of books. While books and their prices are far more accessible than the average individual M.U.S.C.L.E. figure, the message is still applicable. The mistake most people make when valuing books on the web is to take their price form the highest or the mid range. None of the books listed have sold and anybody who had to buy one would choose the cheapest in decent condition; only a mad person would choose to pay more than necessary. Take your price from the low end of books in comparable condition. The University of M.U.S.C.L.E. will certainly continue to address issues related to the value of M.U.S.C.L.E. items in both the M.U.S.C.L.E. Figure Guide and courses like Philosophy 300. How Much Are M.U.S.C.L.E. 's Worth? This entry was posted on Wednesday, July 1st, 2009 and is filed under UofM News. You can follow any responses to this entry through RSS 2.0. You can skip to the end and leave a response. Pinging is currently not allowed.